A rendering of the 22-storey Patient Support Centre (PSC) at the SickKids hospital campus in Toronto. The design includes an undulating façade and a blue-coloured staircase encased in glass to bring physicians, nurses, hospital administration, and foundation employees together in a light-filled environment. The PSC is the first phase of Project Horizon—the SickKids campus redevelopment plan. A café and retail atrium at the ground level opens up the corner of Elizabeth and Elm streets and activates the public realm, thereby creating a new social hub for the surrounding community. The lower floors, that will also be accessible to the public are proposed to include educational and simulation spaces, a learning institute, library, and conference centre. An enclosed pedestrian bridge establishes an integral link on the SickKids campus, connecting the Peter Gilgan Centre for Research and Learning (PGCRL) and the hospital’s main atrium. 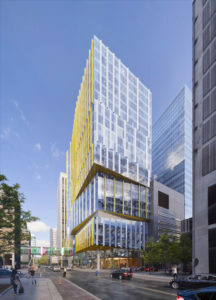 B+H designed the tower’s façade with a degree of transparency to increase connectivity between SickKids and the community. A series of coloured horizontal fins further animates the pedestrian experience, provides shading, and optimizes thermal performance. The tower’s scale and height directly relate to its surrounding campus context and the city, while maintaining its own presence.